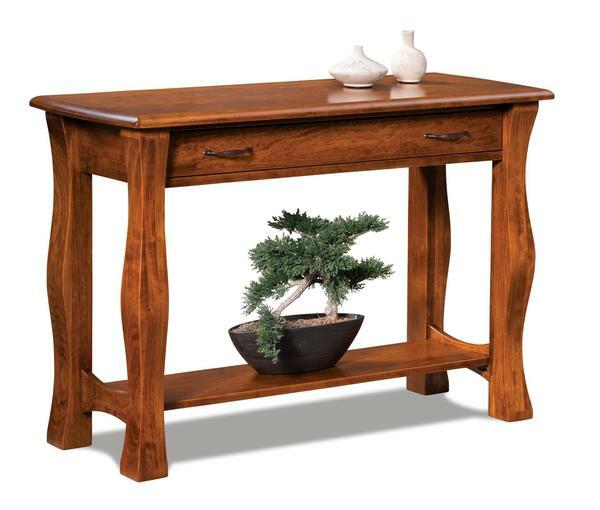 Our Amish Reno Open Sofa Table with Drawer is hard to miss thanks to design features that include a boat-shaped top, flowing legs, and plank-style open shelf near the base. Customize this accent table by adding soft close undermounts to the long drawer, and selecting the wood type, finish, and hardware that catch your attention. Shown in sap cherry with vintage antique finish. *Rustic Woods are available with open knots that are not filled or knots that are filled with an epoxy. See the example in the photo gallery. Shown in Sap Cherry with Vintage Antique.